Coming from the intensity and grittiness of Saigon to beautiful Hoi An with its well polished Ancient Town filled to the brim with souvenir shops, tailors and tourists took some getting used to. At first I was a little put off by the very crowded streets of the old district and the amount of shops, but there is something very pleasant about the place and it looks stunning. One soon learns where to go outside the main drags as well, which really helps. Photo shoot on Tran Phu street in Ancient Town, grabbing the attention of a couple of tourists in the background. 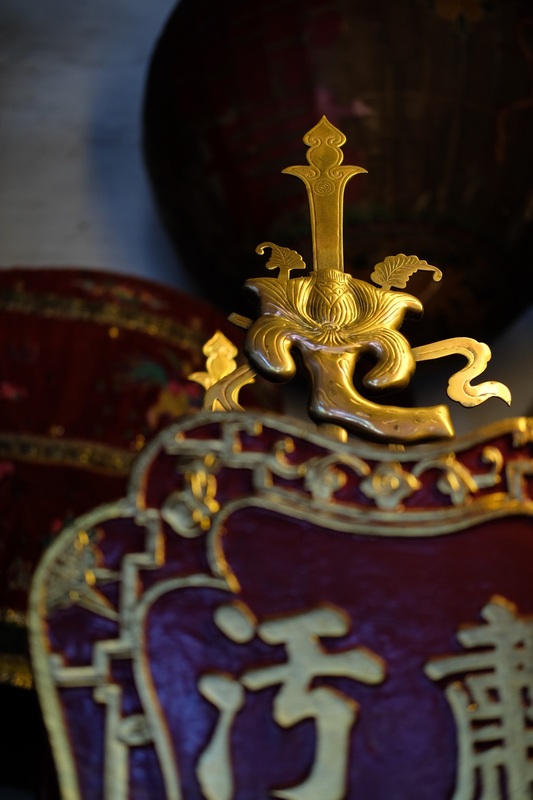 Hoi An was founded as a trading port around 1595, and remained important and wealthy well into the 18th century when it was a powerful trading conduct between Europe and all major parts of Asia. At the end of that century, nearby Da Nang took over when the French got exclusive trade rights there. Because it lost much of its business around this time, very little changed in Hoi An for the following 200 years, effectively it was preserved almost untouched. No shortage of boat tour offers. Just a couple of blocks away from Ancient Town things are a lot more down to earth and typically Vietnamese. Sidewalk cafe with a view to the tennis court, just outside the old district. A newlywed couple, and their film team. Newlyweds on the river after lighting and placing floating lanterns. Lamp shops are everywhere in the old district. The streets of Ancient Town are charmingly lit. Lanterns wherever possible. 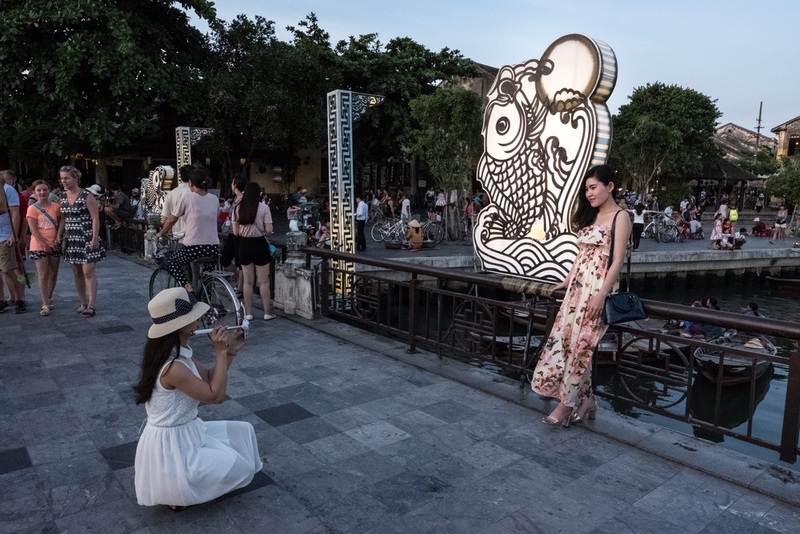 The main bridge in the Ancient Town with the large fish-themed lights is a very popular photography spot. Having a look at the touris while mom checks her phone. 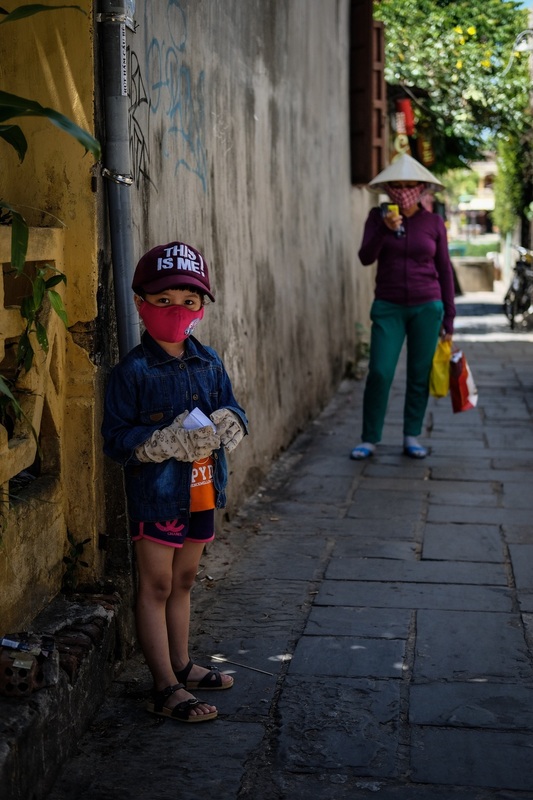 The face masks are ubiquitous in Vietnam, and are mostly for protection against the sun, people try to keep their skin as light as possible. Decoration in gold and red dominate the temples.